Son Jung Wan once again followed her appearance at the semi-annual Concept Korea presentation with her solo runway show the very next day at New York Fashion Week. Last season, the veteran designer – having made her Big Apple debut during the Fall 2011 collections – told Meniscus Magazine that, over time, she has learned to incorporate Western styles into her clothing to better target New Yorkers. As a result, Son has well established herself as a formidable designer in the States, the sophistication of her clothing growing by leaps and bounds. In a contrast to last season’s vibrant colors channeling the artist Marc Quinn, for Spring 2013 she turned to another artist, this time Spaniard Juan Miro, for her “Rhapsody Under the Sun” men’s and women’s collections. “This season I used…ultra lightweight fabrics that move beautifully on the body,” Son said. While retaining elements of last season’s garden theme with floral prints, for her women’s pieces, Son focused on thinner materials (tulle, linen, chiffon) and lighter colors (ivory, gold and teal), giving the collection an airy feel. 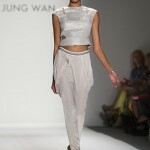 One such example included the skillful use of mesh resembling organza from top to bottom in one blouse. The same held true for the men’s; although traditionally the weaker of the two, this particular casual collection was solid.